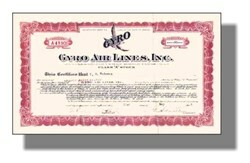 Beautifully engraved certificate from the Gyro Air Lines, Inc. issued in 1934. This historic document has an ornate border around it with a vignette of an eagle with its wings spread. This item is hand signed by the company’s president and its secretary and is over 70 years old. The American Gyro Crusader was a small, futuristic airplane that astonished and amazed the world during the Great Depression. Its magic touched the hearts and minds of all who came to know it, including Amelia Earhart, Howard Hughes and William Randolph Hearst, Jr. Its rich story ranged from aeronautical inspiration, to courtroom drama, to business intrigue. In the end it was unable to raised funds and went into bankruptcy. There is a book written about the Company called The Story of the Shelton Flying Wing by Alexander Roca. You can find out about it at http://www.rareplanes.com.